The photo was taken by me at Meola Creek, just down Motions Road from the zoo, in June 2009 (originally from this post.) The following comes from the Auckland Star, 3 November 1947. 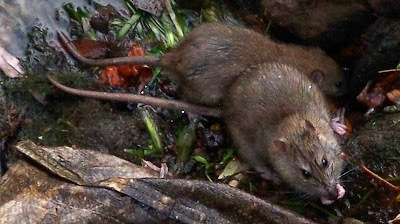 Not the least of the attractions at the Auckland Zoo is a thriving rat colony. Its well-fed members sometimes vie with the legitimate exhibits for attention when, to the delight of small children, and not a few adults, they perform amazing acts of daring in the lion pits, whisk food from under bears' noses and threaten to steal the show in more than one cage. Feeding time is the signal for these zoological "spivs." Then, once the animals have had first pick, it is not unusual to see a score of rats swarm over the rocks to surround a piece of meat almost at the feet of a lion. A rat may look at a king, but what a rat can do in the presence of a lion is surprising. According to the keepers the rats count for nothing in the lion and tiger pits. The animals, well provided with all the meat they need, ignore them. In fact, almost the only part of the zoo where they are given short shrift is in the monkey cages, where they are hustled out as soon as they appear. But elsewhere they claim plenty of public interest. Mothers tasking their children out for an educational afternoon are often perturbed to hear them shout, "Look, there's another rat," when they should be concentrating on the brown bears. The impression these unwelcome exhibits make was shown the other day when a five-year-old boy, asked what he saw at the zoo, answered, "Lots of rats." The growth of the rat settlement is partly a sign of the times. Before the war the zoo authorities were keeping the rats down with a special poison which does not harm the birds or animals. The war cut off supplies, and in the last two years shipments have been erratic. Another stock of this liquid has arrived recently and hundreds of baits of saturated bread have been laid. It will take some time, however, to reduce the lead the rats have gained. Rocky ground and the rats' ability to burrow test the resourcefulness an patience of the workers. To add to their troubles a large City Council rubbish dump in Old Mill Road makes an ideal breeding ground for rats, which only have to cross the road to join the zoo colony. I have an amusing mental picture of the commotion among the monkeys when a rat was spied.